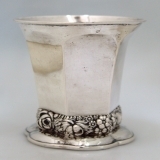 American sterling silver napkin ring in an open work Baroque Scroll design by Towle Silversmiths, c.1890. 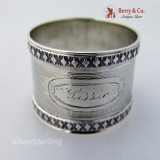 This attractive napkin ring has applied open work fancy scroll borders and is inscribed Mary. Weighing 26 grams, it is 1 7/8" in diameter and 1 1/8" wide. Inscribed as described above, the soft, warm, original finish is present, with no buffing or machine polishing. The excellent original condition and clear detail, with no removals, repairs or alterations, make this an especially attractive offering. American coin silver napkin ring with an engine turned body and applied diamond and dart borders on a stippled background. Unmarked, but guaranteed to be as represented, this attractive napkin ring is inscribed Lizzie and is 1 5/8" in diameter, 1 1/8" wide and weighs 19 grams. Inscribed as described above, the soft, warm, original finish is present, with no buffing or machine polishing. The excellent original condition and clear detail, with no removals, repairs or alterations, make this an especially attractive offering. 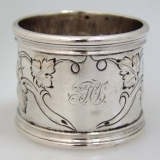 American sterling silver napkin ring with applied foliate scroll borders and a bright cut engraved blank cartouche, c.1890 with the side opposite of the cartouche being inscribed Sallie Dunham Twitchell from Aunt Martha. 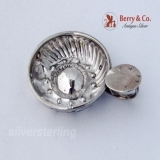 This delightful napkin ring is 1 3/4" in diameter, 3/4" wide and weighs 15 grams. Inscribed as described above, the soft, warm, original finish is present, with no buffing or machine polishing. The excellent original condition and clear detail, with no removals, repairs or alterations, make this an especially attractive offering. English sterling silver floral engraved napkin rings, 2, by Cornelius Desormeaux Saunders & James Francis Hollings (Frank) Shepherd with a full set of Birmingham Hallmarks for 1901. 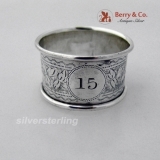 Each of these attractive napkin rings has allover floral engravings and a central round cartouche, one blank and the other inscribed with the number 15. Weighing 11 grams, each of these undersized napkin rings is 1 1/2" in diameter and 1" wide. Inscribed as described above, the soft, warm, original finish is present, with no buffing or machine polishing. The excellent original condition and clear detail, with no removals, repairs or alterations, make this an especially attractive offering. The price is for the pair. 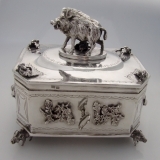 American sterling silver napkin ring by Gorham Silversmiths c. 1890. This stunning napkin ring has applied pond lily borders and is monogrammed JCW and marked Lion Anchor G, Sterling and B208. Dimensions: 1 7/8" - 1 1/2" weight 45 grams or 1.5 ozs Troy. The excellent original condition and clear, crisp detail, with no removals repairs or alterations, make this an especially attractive offering. Monogrammed as described above, the soft, warm, original antique finish is present, with no buffing or machine polishing. 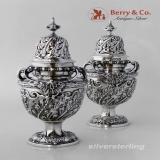 English sterling silver beautiful pair of sugar shakers by William Gibson & John Lawrence Langman, London, date marked for 1898 and 1899. These beautiful shakers measure 7 1/2" tall and weigh a total of 701 grams or 22.5 ozs Troy. The excellent original condition and clear, crisp detail, with no monograms, removals, repairs or alterations, make this an especially attractive offering. The soft, warm, original finish is present, with no buffing or machine polishing. American sterling silver Art Deco oval napkin ring by Gorham Silversmiths, c.1930. This handsome oval napkin ring has straight line engraved decorations surrounding a rectangular central cartouche containing a period monogram R. The napkin ring is 2 1/2" - 7/8", 7/8" tall and weighs 23 grams. Monogrammed as described above, the soft, warm, original finish is present, with no buffing or machine polishing. The excellent original condition and clear detail, with no removals, repairs or alterations, make this an especially attractive offering. American sterling silver large Pond Lily napkin ring by Gorham Silversmiths, c.1890. This ornate napkin ring features wide borders of applied Pond Lilies and is marked B209. Weighing a substantial 47 grams or 1.5 ozs. 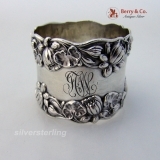 Troy, the napkin ring is 2" = in diameter, 1 7/8" tall and is monogrammed, in ornate, period script THT. Monogrammed as described above, the soft, warm, original finish is present, with no buffing or machine polishing. The excellent original condition and clear detail, with no removals, repairs or alterations, make this an especially attractive offering. 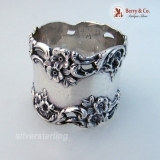 American sterling silver Baroque floral open work scroll napkin ring by Simons Brothers of Philadelphia, c.1890. This elegant napkin ring has applied floral, foliate and open work scroll borders and is 2" in diameter, 1 1/2" tall and weighs 37 grams or 1.2 ozs. Troy. The excellent original condition and clear, crisp detail, with no monograms, removals, repairs or alterations, make this an especially attractive offering. The soft, warm, original finish is present, with no buffing or machine polishing. American sterling silver fish serving set with figural dolphin handles and a wonderfully hammered finish by Duhme & Co. of Cincinnati Ohio, c.1875. The serving fork: 9 1/4" long, the serving knife knife is 13" long. 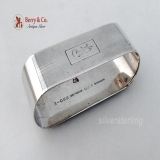 The total silver weight is 297 grams or 9.5 ozs Troy. The excellent original condition and clear, crisp detail, with no monograms, removals, repairs or alterations, make this an especially attractive offering. The soft, warm, original finish is present, with no buffing or machine polishing. 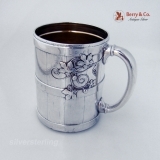 American sterling silver Aesthetic mug or cup by Tiffany and Company, c.1870. The mug was bears the marks of Edward C. Moore, whose company was bought by Tiffany in 1868. This fabulous Christmas mug is in the shape and style of a wine barrel, with riveted straps and has applied grape vines. Inscribed, on the bottom of the mug, in period script: Charles Kerner December 25th, 1871. 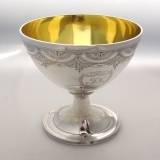 This wonderful mug has a gilt interior and is 3 7/8" tall, 3" in diameter, 4 3/8" across the D shaped handle and weighs a substantial 243 grams or 7.8 ozs. Troy. Inscribed as described above, the soft, warm, original finish is present, with no buffing or machine polishing. The excellent original condition and clear detail, with no removals, repairs or alterations, make this an especially attractive offering. 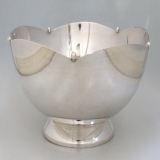 American sterling silver Arts and Crafts pedestal serving bowl and matching ladle in an ornate floral pattern by Julius Olaf Randahl, the founder of the Randahl Shop of Chicago, having the old JOR hammer mark, c.1915. This scarce Chicago made set is some of Handrailâ€²s best work. Ornate pieces from Randahl are scarce. 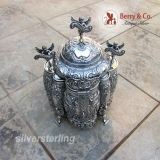 Dimensions: 5 1/2" in diameter, 3 3/8" tall, ladle 5 1/2" long, total silver weight 250 grams or 8 ozs Troy. The excellent original condition and clear, crisp detail, with no monograms, removals, repairs or alterations, make this an especially attractive offering. The soft, warm, original finish is present, with no buffing or machine polishing. American coin silver napkin ring with beautiful oak leaf and acorn decorations, c.1860. This handsome napkin ring measures 2 1/8" in diameter, 1 1/2" tall and weighs 41 grams or 1.3 ozs Troy. The excellent original condition, monogrammed HR 8, repairs or alterations, make this an especially attractive offering. The soft, warm, original finish is present, with no buffing or machine polishing. 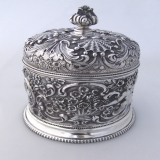 American coin silver napkin ring with floral repousse decorations, c.1880. This handsome napkin ring measures 1 7/8" in diameter, 1 3/8" tall and weighs 28 grams or0.9 ozs Troy. It is inscribed: "Cyrus from Lucia". The remarkable original condition and clear, crisp detail, with no repairs or alterations, make this an especially attractive offering. The soft, warm, original finish is present, with no buffing or machine polishing. 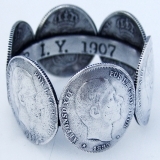 American coin silver napkin ring made out of 6 Spanish Alfonso XII silver coins, 1907. This handsome napkin ring measures 1 3/4" in diameter, 1" tall and weighs 37 grams or 1.2 ozs Troy. It is inscribed: "Happy New Year I. Y. 1907" on the inside of the ring. 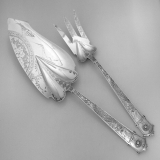 An exquisitely detailed floral motif and stunning workmanship come together in these lovely Art Nouveau Period salad servers, done in the Fiorito pattern, c. 1902 by George W. Shiebler and Co. of New York. 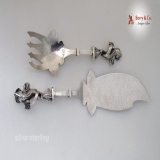 The unique handles are brilliantly decorative poppies complemented by dainty foliate embellishment. Fiorito is a multi motif pattern. As the name suggests, ("fiore" is Italian for flower) they have a distinctly European charm. The spoon measures 7 5/8" and the fork measures 8". The weigh a combined 113 grams or 3.63 Troy ounces. The excellent original condition and clear, crisp detail, with no monograms, removals, repairs or alterations, make this an especially attractive offering. The soft, warm, original finish is present, with no buffing or machine polishing. 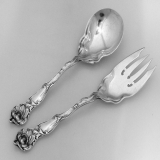 American sterling silver fish serving set, knife and fork in the Japanese pattern by Gorham Silversmiths, c.1871. Both pieces are embellished with gorgeous acid etched Asian inspired motifs of nightingales, cherry blossoms and decorative borders done in remarkable detail. The knife measures 11 7/8" and the fork measures 9 1/4". They weigh a combined 6 troy ounces. Each has an ornate, period monogram FW on the back of its handles. The excellent original condition and clear, crisp detail, with no removals, repairs or alterations, make this an especially attractive offering. The soft, warm, original finish is present, with no buffing or machine polishing. American coin silver napkin ring with repousse grape leaf decorations, c.1860. This handsome napkin ring measures 2" - 1 1/2" and weighs 54 grams or 1.7 ozs Troy. The excellent original condition and clear detail, with no removals, repairs or alterations, make this an especially attractive offering. Monogrammed HT, the soft, warm, original finish is present, with no buffing or machine polishing. 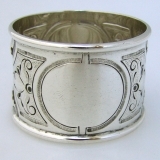 American sterling silver Art Nouveau napkin ring in the Florence pattern by Frank Whiting, c.1910. This beautiful napkin ring measures 1 7/8" - 1 3/8" and weighs 35 grams or 1.1 ozs Troy. The excellent original condition and clear detail, with no removals, repairs or alterations, make this an especially attractive offering. 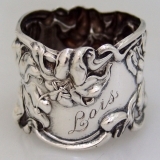 Monogrammed Lois, the soft, warm, original finish is present, with no buffing or machine polishing. 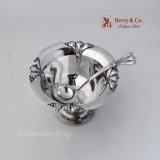 American Colonial Revival style sterling silver serving bowl by Currier & Roby Silversmiths of New York City, c.1940. 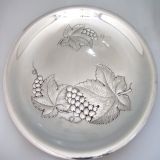 This stunning bowl has a scalloped edge with applied balls at the low points of the egdge. Weighing a substantial 438 grams or 14.1 ozs. 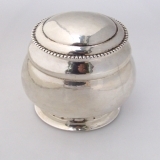 Troy, and being 7 1/2" in diameter and 4" tall, this bowl will display nicely and be a useful addition to your silver collection. The excellent original condition and clear, crisp detail, with no monograms, removals, repairs or alterations, make this an especially attractive offering. The soft, warm, original finish is present, with no buffing or machine polishing.